If your knitting looks like something the cat has been playing with then there is a group that meets each Wednesday in the Pelican Room of Mona Vale Library that offers some help – not only will you learn from ladies who have been knitting for centuries between them, the range of projects being completed by this group boggles the mind. Everything from classic Fair Isle patterns to socks to beanies to teddies has been undertaken. This week we share an insight on where all those who get their wool in knots can receive free lessons and help on the simplest to most complicated of knitting creations and spend time with some lovely people into the bargain. The Sydney Craft and Quilt Fair 2014 (July 9th to 13th on Glebe Island) begins tomorrow, and these girls will be going, rugged up against the cold breezes in something wonderful they’ve made themselves no doubt! Sunny: this year we’re all knitting on the ferry on the way to the Craft and Quilt Fair. We also do knitting for Stewart House, to support their great work. How long has the group Woolly Wednesdays at Mona Vale Library been going? Four and a half years. We started in the winter of 2010. 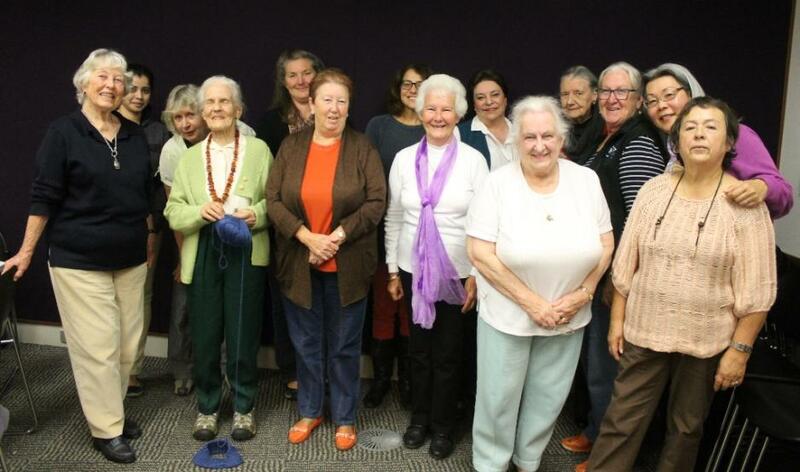 Pittwater Council asked us to do this and provided a venue to teach people to knit. We also teach people to crochet. If they have a problem or a pattern they can’t work out they can bring it down here and we’ll go through it and help them with it. We meet here every Wednesday from 1.00 pm to 3.00 p.m. and all are welcome. I’ve been knitting since I was six. I’ve been with the Department of Education for 60 years and can’t count how many children I’ve taught to knit. I always knitted while on playground duty and sometimes knitted at the Cross Country. The students would ask me to help them with their knitting – if they’d made a mistake they’d leave it at the staff room in the morning and come back at lunchtime to pick it up. What is the best thing about knitting? It’s very therapeutic. Television, let’s face it, is not mind boggling and as you get older one needs to do something useful. It’s good for your hands; not knitting with metal but using bamboo needles; the weight of the project is in your lap, not on your wrists. There’s a great array of varying knitting projects here; ladies making socks with round needles, a Fair Isle pattern jumper being made - there’s traditional and contemporary pieces here. Sunny: Yes. Rona is our star. Rona has won the major tea cosy award twice at the Morpeth Tea Cosy Compeition. How long have you been coming to Woolly Wednesdays? What do you want to learn how to knit? I Googled and got Manly Community Centre and they gave me a phone number for here and I came here. I live in Dee Why. I’ve just finished knitting red socks and am now knitting Beanies for Stewart House. I’ve finished knitting an Aran sweater for a customer this morning – I’m also working on a multicoloured pink rug for my granddaughter, with a bit of luck she might get it this year. Maureen: we have a competition occasionally to see who has the oldest UFO – unfinished object! What’s the best thing about being part of a knitting group? Elaine: it’s fun, that’s why we do it. If it wasn’t fun we wouldn’t survive. You never stop learning – I though when I first joined the Guild that I knew a fair amount, I’d knitted all my life; my mother taught me and I had to knit myself a school cardigan, and it just went on from there. During the war (WWII) we were knitting socks, gloves and balaclavas of course and these were all sent to the soldiers who were serving. That was a good experience – to be doing that. I did a TAFE course which they don’t offer anymore; Advanced Certificate in Needlecraft. I told them I wanted to do knitting and when I signed up they said they didn’t do that as everybody already knits; I explained I had a cupboard full of yarn and as I’m an awkward shape wished to learn how to knit to know that it will fit me. They told me I should join the Knitters Guild as they don’t teach knitting. I completed the course anyway, which I’m proud of, and learnt a lot. I then joined the Knitters Guild and still haven’t stopped learning, it’s been great. You’re learning how to knit? My son-in-law Joshua asked me for a beanie. I bought him one but feel he would prefer it if I knit one for him. He will appreciate it more. I knitted a shawl for my daughter but she hasn’t ever used it; it’s a nice purple colour and made from very thick wool, knitted with 12mm pin needles, and looks very nice with little black dresses. How long have you been knitting here? I’ve been coming here for about eight months now. Why did you want to come here to knit? Just to sit with like minded people. We have friendship within the group, and to do some charity work. Were you a proficient knitter before attending or do you learn more while here? I’ve always been knitting and crocheting but yes, we share ideas and skills; knitting is something where you are always learning a new skill. You can always learn something and yes, I have learnt more while coming here. What sort of charity work are you doing here? We do charity work to support Stewart House – I make Trauma Teddies and rabbits for the children to cuddle. It is very complicated. My mother is an avid knitter and has always done all the knitting so I have known how to knit since I was a child. This is the most complicated thing I’ve ever taken on. I’ve only just started with this group, this is my second visit. I thought it would be great to get a bit of support when the going gets tough. What made you attempt something as complicated as a Fairisle pattern? I thought if I’m going to do something I’d like to try something challenging, and my son really wanted a Fair Isle jumper, so I thought I’d give it a go. It’s a creative challenge. *Fair Isle (from Old Norse Friðarey; Scottish Gaelic Fara) is an island in northern Scotland, lying around halfway between mainland Shetland and the Orkney islands. It is famous for its bird observatory and a traditional style of knitting. How log have you been coming here? This is my second week. I’m making a pair of socks. You have five needles there? Yes, five needles on the go. This is how you make them – you just go round and round….and look at the wool – you don’t have to do anything except knit and you get this great pattern. You use five needles so you may keep working around in a circle, it’s a spiral, and although it looks complicated it’s not because you’re only doing plain knitting. It’s more about he size of the needles and the wool, so there’s more knitting involved. I’m knitting a cardigan for myself – this is a rib to start with, which goes to the underarm and then changes into a pattern. Today is my first day. I’ve been knitting for a long time and was a member of the Knitters Guild but wasn’t able to get to the meetings often enough so I let that go. Now that I’m retired I can come to this and enjoy the company of the other ladies and learn more about all the kinds of knitting there are. What are you knitting today? I’m replacing a Sirdar* garment that I made back when I lived in Melbourne and worked for Coates-Paton – this is mohair and silk – it has finally decided to drop to bits. The lady beside me is photocopying the pattern for herself; it’s a much loved shaped and will be very warm. * Sirdar is a design-led yarn manufacturer with a great heritage that can trace its roots back to the 1880s. They also have a wide range of pattersn, many of which are still used today top make classic garments. About four and a quarter years. What is good about being part of a knitting group? I like the companionship. Quite often I’ve been asked to teach someone knitting or crocheting and I like sharing and teaching. What are you knitting at present? I’m knitting beanies for one of my great-grandsons. I’ve just finished a couple of sweaters – done one for the other one, and thought I won’t hand them over until I’ve got the other beanie done. I joined the Knitters Guild in 1992 when I retired and have been coming here since it started at the library. What’s the best thing about being in a knitters group? I started knitting when I was four, my grandmother taught me. It runs in the family, we all knit. I like the companionship of coming here, we all learn from each other too. There’s a lot of creative stuff that we swap; I’m a spinner as well, this too has run in the family. 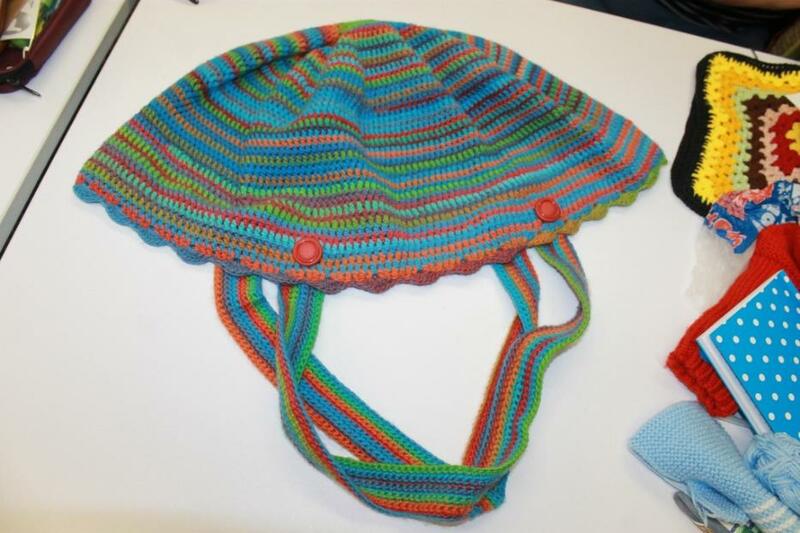 I just started a baby jacket – I knit for Mona Vale Hospital and for the charity called Wee Care, for tiny tiny babies. Since I retired in September but I’ve been knitting since I was about five years old. It’s good therapy, a good way to unwind. You get to meet new people and sit down and have a chat. I’m also leaning new skills; for a long time I’ve put off knitting on circular needles but now I’ve seen others doing it and they’ve shown me the tricks and I now feel confident to give it a go. These are socks. I’ve just finished an assignment for Nundle Woollen Mills of red socks. These are for a designer called ‘Akira Isagawa’* in town who wanted 60 pairs. Some of the ladies here have helped make them. This pair here, where one is bigger than the other, is what you shouldn’t make. Akira commissioned the Wool Innovations people to produce 60 pairs of red socks for him as when he first started out he couldn’t afford shoes for his models. They all wore red socks or slippers. He is now having an anniversary celebration for his 21 years on the 4th of July, 2014 and wants to give all his guests a pair of hand knitted red socks. What a lovely gesture! They’re superb socks. * Akira Isogawa is one of Australia's most prominent contemporary fashion designers. He opened a store in Woollahra, Sydney, in 1993. By the late 1990s, he was known internationally. His clothes appear under his own label and are sold in Australia and New Zealand, and 10 other countries. Born in Kyoto, Japan in 1964, he immigrated to Australia in 1986, studying fashion at East Sydney Technical College drawing inspiration from contemporary Japanese design. Maureen: and they’re all different, individual. Everyone has done a different pattern. I’ve been attending about three years. What’s the best thing about it for you? I think it’s the friendship of everyone. Gwen: might I add that Maureen is the convenor of our local branch of the Knitters Guild. Maureen: I am indeed. I’ve been going to the Knitters Guild for about three years and became the convener earlier this year. The Knitters Guild is a bit more formal to what we have here. We have a proper meeting with minutes etc. and have a speaker at these monthly meetings who teaches us something new. At present we’re actually making Beanies as a project, to raise money for Stewart House School. These will be for sale at The Craft Show. I knit mainly easy things as I do my knitting while watching television and you can’t knit a pattern while watching television! Gwen: the Knitters Guild was started in 1986 by my neighbour, Margot Chick. Sunny: Margot advertised for Expressions of Interest to form the ‘Knitter’s Guild’; 39 interested people attended the first meeting – so the Knitters Guild was formed. Maureen: Which then spread to other suburbs. Today there is 30 odd of these. What are you making here today? I’m making teddies for Mona Vale Hospital, for their stall. I’ve been doing this for three years. This is my fourth time as part of Woolly Wednesdays. What’s the best thing about being part of a knitters group? The friendship; Exchanging ideas, knitting books, needles, wool, patterns ; all those sorts of things. Just sitting and having a chat is pleasant and getting out and about. We taught Gil to knit.! Gil (who says he is the token man), is a teacher who has just retired from Mona Vale Public School. I’m a retired teacher, 73 years of age and have only just retired last year after teaching for 50 years. I’ve just joined this group; I come along as a token male to show that blokes can knit. I’m trying to make a great big blanket. I see the most beautiful things being done here. I’m making children’s bookmarks to raise money for the Save The Children Fund at present. I’m doing something with wool but in a different way. Even blokes can knit. What is the Woolly Wednesday Knitting group’s favourite place in Pittwater? The Pelican Room at Mona Vale Library – here! What is the motto for the Woolly Wednesday Knitting Group? Woolly Wednesday Ladies (not all members present). A Bag made by one of the Woolly Wednesday girls. Right: A charming Christmas ‘yarn bombing’ attack occurred at Park Street, Mona Vale late last year courtesy of the Woolly Wednesday knitting group from the library. - Picture courtesy Enliven Pittwater, November 27th, 2013. The Knitters' Guild NSW Inc. was established to promote and encourage the disciplines of handknitting and crochet. It also encourages the maintenance of high standards in design and technique, provides the opportunity for the exchange and provision of information and education in the craft and encourages the exhibition of member's work. The Guild was formed in 1986 and has members statewide. Groups meet regularly throughout the Sydney Metropolitan area and country NSW. The Guild is affiliated with various craft organisations. The Guild regularly arranges workshops and demonstrations in many disciplines including Aran Knitting, fine lace and Shetland lace knitting, Fair Isle, Crochet etc. The Guild's headquarters and library is situated at Dence Park, Epping. Books and patterns are continually being added to this collection and can be borrowed by members. The Archives Committee aims to preserve and exhibit examples of knitting and crochet and patterns from the past. A newsletter is regularly published and distributed to all members. Knitted items such as beanies, caps, bed socks, jumpers, cardigans, scarves, rugs. Stewart House does not receive government funding and receives most financial support from the NSW Teachers' Federation, as well as public donations. More information can be found on the Stewart House website. See us at our new home in 2014! In 2014, Craft & Quilt Fair Sydney will be moving to the exciting NEW Sydney Exhibition Centre site at Glebe Island whilst the Sydney Convention and Exhibition Centre in Darling Harbour is being redeveloped over the next three years. Enliven Pittwater is spreading the Christmas cheer with some festive fun throughout our village centres. A charming Christmas ‘yarn bombing’ attack has occurred at Park Street, Mona Vale courtesy of the Woolly Wednesday knitting group from the library. Council’s Social, Community & Economic Coordinator Melinda Hewitt said the knitting group have embraced Council’s program to enliven Pittwater by producing ‘knit graffitti’ as part of their plan to bring people together through the art of knitting and crocheting. Newport is playing host to a ‘Very Christo Christmas’ with a quirky art installation at the community centre. Ms Hewitt said the homage to the artist Christo would come in the shape of some large ‘Christmas gifts’ for the community to enjoy in the sculpture garden of the centre. “Residents will also see the attractive Enliven Pittwater flags that are adding some festive cheer along Barrenjoey Road, Newport,” she said. Avalon, Mona Vale and Newport Chambers of Commerce along with Enliven Pittwater are also supporting special Christmas window displays for shops throughout the villages. “We are encouraging residents to get on board, by spotting their favourite window display and tagging it #enlivenPittwater,” said Ms Hewitt. Ms Hewitt said the best way of keeping up-to-date on events throughout Pittwater is to download the free Enliven Pittwater app, available from the App Store and Google Play. Yarn Bombing by Woolly Wednesday girls - image courtesy Enliven Pittwater (27.11.13). Copyright Woolly Wednesday Knitting Group, 2014.